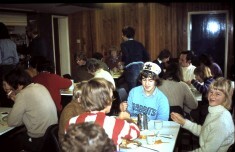 Memories of the Early Days of The reformed 1st Harston Scout Troop. It was in the late sixties that I was hitch hiking from Harston to college in Cambridge, when I was given a lift by a Cherry Farmer from Melbourn. I think his name was Jack and he was an area commissioner, or something like that, in the Scout Organisation. He soon ascertained from our discussion that I had been a Scout as a boy, and asked if I thought there ought to be Scouting in Harston, to which I said yes, but I wouldn’t want to run a troop myself, well not all on my own. He must have asked my name and telephone number, because a few months later, I got a call to say he had found somebody who might be interested in working with the Scouts in the village. Like me he had not been a Scout Leader before, but had served in the Brigade of Guards in the British Army, and was keen to be involved. David was known to me and he and his family owned the orchards that were almost next to and behind my parents’ house, so not an unknown person to me, and someone I was about to get to know a whole lot better. Meetings were arranged with other South Cambs Scouters ,such as Dr Ian Hinton and Derek Hobbs, both successful Scout leaders in Whittlesford and Great Shelford. Promises of help were accepted and we agreed to start Scouting off again in the Harston. Various names were passed on to us that might be of help, plus some personal friends and these were all put to use to get us started. Albert Lawrence told us of a fund of about Thirty pounds held in trust from the days that he was a Scout in the village himself, and Jan Stekely of Welding Alloys in Fowlmere agreed to transport kit around for us if we had a camp and print off any letters we might need to circulate. Ian Hinton wisely said that we should get the boys interest by organising a camp as soon as we can. David in his work travels found the Suffolk County Council Camp site, by the river in Santon Downham and quickly booked it for the Whit week school holidays. Thirty pounds was not enough to kit out a troop for a camp so we had to raise money, with no parents committee to help. David or Skip as he was known, and myself known as Bosun, not my usual John, had to get to work. We organised a sponsored walk which took us out through Haslingfield, Barrington, Shepreth, Melbourn, Fowlmere ,Newton and back to Harston. I had a date the night of the walk and ran most of the way from Fowlmere, in walking boots, to get home in time to get out again. This cash and Albert lawrence’s connection with Soham Grammar School, who loaned us patrol tents, Alistair Green’s father who obtained a gas hob at a low price from Sprites caravans, a company where he was an executive, got us started. A bit of shopping and we had bought a cooking tent, toilet tent, cooking pans, a rope for a kind of zip wire, and a second hand two seater PBK16 canvas canoe, life jackets and paddles, Chemical toilet etc. Jan Stekly’s pickup truck and Davids car and trailer, plus a few parents delivering boys, provided the transport to Suffolk. David’s wife Lorna came in a borrowed campervan to oversee the cooking and give professional first aid care. One boy did cut himself with a bow saw and I had to take him to Bury St Edmunds. The injury was not serious. The camp was seen as a great success, with us learning that most of the boys did not want fancy food, or indeed a varied menu, they liked it simple. Our efforts to provide a healthy balanced diet as per Scout rules for camping, actually meant that some delicious good quality food found the waste pit, in favour of extra helpings of beans. An inspection by a local Scout official passed well, the menu as set was seen to be good and the camp was well set out, with a good programme of fun and learning. We had a camp fire each evening with songs being sung around the fire to my guitar. On one occasion we invited the American Girl Scouts camping on the next site to join us; a real hit with the boys as was giving them rides on the not so fast Zip Wire the next morning. After the camp we set about raising more money. Weekly subs were only enough to cover the badges the boys were beginning to earn, so with the Webb Ivory catalogue at Christmas selling cards and gifts, then later with the collection of Newspapers, which were stored in Mrs Manley’s shed behind the filling station and car sales yard, reasonable and regular funds came in. With the success of the PBK16 canvas canoe we decided to look into getting more canoes, and to this end the two of us visited a company in Wollaston, Northants, who made canoes and also sold materials and expertise for the making of them. On the same day we visited another firm that sold canoes and equipment in Wetherby. The outcome of this being a days training course in Wollaston and placing an order for materials, tools, mould hire and the consent to copy their mould allowing us to make further canoes. David had a very useful brick building at his orchard, only two doors from my house and offered it as a canoe production base, so tents and equipment were stacked high and small to allow for the work to begin. Over a long weekend we made one canoe and then copied the mould using our new canoe and half the mould at a time to make our own mould. Within a short time this was followed by canoe number two. The boys now had a target to go for, collect x tonnes of newspaper and we will make more boats for you. This we did using ours and enthusiastic Scouts labour, eventually working a system where we took orders for two canoes from families, neighbours, or work colleagues of mine, bought materials for three. The idea being the customers paid all the material costs, we then supplied some labour, and our expertise of course. Using our mould we made three boats of which one would be the pride of Harston Scouts. Newspapers paid for the lifejackets, paddles, spray covers etc. In the first instance buoyancy came from empty plastic draught sherry bags from my works social club off licence. In my time with the troop I believe we owned something like eight boats, made from our mould, plus a bespoke canoe trailer made by Wicksteeds at Royston. Our second camp was held in Constable country ,again a delightful spot by a river and part of a small stud farm. By now we had our own patrol tents, a frame tent for David and I, pioneering poles and other equipment. The canvas canoe needed recovering, so we took the canvas and my tools to camp with us and I spent the first day recovering the canoe for use during the rest of the camp. Our most ambitious camp was a week using a canal camping barge and Butty barge on the Grand Union and Oxford canal. We started the week at the bottom of the Foxton flight of locks near Market Harborough and went to Banbury and back. We often fed on the move, cooking parts of lunch on one boat and the rest on the other one, passing food containers from one boat to the others. 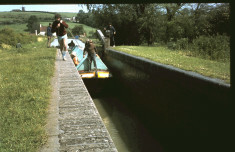 The more experienced and basically the older boys canoed alongside us as we chugged along the canal. Each year in early November we started a short weekend trip to Derbyshire to walk the hills, and usually included a visit to one of the many cave systems around Castleton. On the first occasion we took a small group. My old car and David’s smart company car were accompanied by a work colleague of David’s called Roger Angel, thus bringing two good cars, and one old side valve Ford Anglia, but I have to say it was Roger’s car, not mine that got the puncture. On later trips a work colleague of mine, John Wintle, came with us, as he had done on the barge trip, to give support, then Nigel Tebbit’s father John joined us followed by other parents that had suitable cars to carry the boys. We used both the Youth Hostels at Edale and Crowden for these weekends, and found them extremely popular with the boys. We opted for supplied meals rather than cooking ourselves. We did the daily chores, which could involve washing up, peeling potatoes or sometimes making our own packed lunches. By now we had boys from Harston, Newton, Hauxton and Little Shelford, maybe other villages, enjoying the blend of fun and learning we were able to give. We were beginning to feel stretched with the commitments of life and work, and at this time we really needed more help, not less and I would not be able to be involved in the long term. When I married and planned to move away from the village I shared David’s concern that he, now with a small parents committee, would need to get someone to replace me. We had worked as a team of two for about three years, raising the funds, making equipment and generally having a great time, building a troop from scratch. 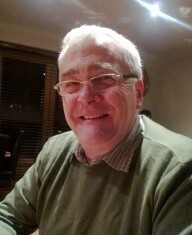 It was great news when Roger Summerfield, an experienced Scout leader, came into view. I felt happy that the troop was now about to take another leap forward in its progress, and need not feel guilty about moving away, and leaving the enterprise I had been privileged to be involved with from its inception. I did return once after my marriage to go on my last November weekend, which I had been involved in planning, and was greatly heartened by the number of parents that were now supporting the Troop, of which several of them came on the trip to Crowden YH, doing all the planned walks. I remember many of the names you mention John. The fruit farmer from Melbourn was called Jack Palmer and I have early childhood memories of his tractor being used to tow a caravan for the South Cambs Venture Scouts, (SCVS) into a field in Foxton to serve as their HQ. SCVS was started by my late Father Mr Peter Holmes. I recognise many of the names you mention such as Dave and Lorna Clark and Nigel and John Tebbit and Roger Summerfield. I was a scout in Whittlesford scouts under the great eccentric Ian Hinton (Doc) – I have recently re-establised contact with him and, indeed, went to the grand opening of the new Whittlesford and Duxford HQ – I think I was the oldest scout there!? His guidance as a young boy have stood me in good stead for the rest of my life so far! I am slightly surprised that my dear Mum, Mrs Betty Holmes. doesn’t get a mention as it was she who ran the Harston cub pack from its inception until the Scout Association forced her to retire because she was ‘too old’!!! (How ridiculous was that?) I’m sure she had a good few years more in her then! Sadly, Mum passed away on the 8th of January this year, at the grand age of 85 having slowly deteriorated with old age dementia.